Perl/Tk is the marriage of the Tk graphical toolkit with Perl, the powerful programming language used primarily for system administration, web programming, and database manipulation. With Perl/Tk, you can build Perl programs with an attractive, intuitive GUI interface with all the power of Perl behind it.Mastering Perl/Tk is the "bible" of Perl/Tk: It's not only a great book for getting started, but the best reference for learning the techniques of experienced Perl/Tk programmers. The first half of the book contains the basics on how to use Perl/Tk, and then branches out into advanced applications with a series of extensive program examples. 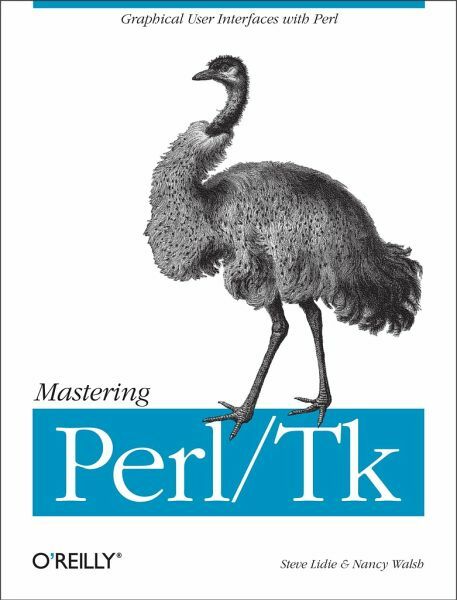 The result is a book accessible for novices, and invaluable for experienced programmers ready to learn the next step in the elegant and effective use of Perl/Tk. The book includes: * An introduction to each of the basic Perl/Tk widgets and geometry managers * A dissection of the MainLoop, including how to use callbacks and bindings effectively * Coverage of the Tix widgets, an extended set of widgets that are a part of the standard Perl/Tk distribution * Working with images in Perl/Tk, including bitmaps, pixmaps, photos, and how to compose a compound image type * How to create custom mega-widgets in Perl/Tk, both composite and derived * Handling interprocess communication with Perl/Tk, both with standard Unix utilities (pipes and sockets) and with the send command designed for direct communication between Tk applications * Developing your own Tk widget in the C language * Examples of web applications written with Perl/Tk and the LWP library The book also includes appendices on installing Perl/Tk, a complete quick-reference for each standard widget, and listings of all the extended examples in the book.Nancy Walsh is the author of Learning Perl/Tk, and Steve Lidie wrote the Perl/Tk Pocket Reference as well as a series of Perl/Tk articles in The Perl Journal. Together, they have written Mastering Perl/Tk to be the definitive guide to Perl/Tk. Steve Lidie has spent decades consulting, programming and administering systems from Apple, CDC, DEC, HP, IBM, Microsoft and SGI. Author of the Perl/Tk Pocket Reference and graduate of Lehigh University, he currently manages the University's large-scale scientific computing complex, and occasionally writes Tk articles for The Perl Journal and PerlMonth. Nancy Walsh has been involved with Perl (and Perl/Tk) since 1996. She received a Computer Science degree from the University of Arizona in 1993, and currently works as a Principal Consultant for XOR, Inc. doing J2EE and Java work on various projects. Nancy has taught several Perl/Tk Tutorials at the O'Reilly Open Source Conference and is also the author of Learning Perl/Tk. Hier wird sehr ausfuehrlich die graphische Oberflächenprogrammierung mit Perl/Tk beschrieben. Sind viele IMHO recht gut gewählte Beispiele drinnen. Und es wird auch recht häufig auf Tk mit Win32 eingegangen. Gefällt mir besser als "Einführung in Perl/Tk" von Nancy Walsh, weil es viel mehr auf die Perl-Seite von Tk eingeht.